Read the Groundhog Emergent Reader at MakeLearningFun.com - the Groundhog sees parts of a snowman. Download my book What Did the Groundhog See? at BoardmakerOnline.com. In this printable book, the groundhog sees the shadows of the same animals found in Jan Brett's The Mitten. Use the pull-offs to retell the story, play a matching game, or respond to questions about the story. Use to teach past tense, possessive -s, WH questions, early predicting, negations (it's not the rabbit's shadow), and increased utterance length. Find 30 additional groundhog activities at BoardmakerOnline.com. Included were Where is the Groundhog? 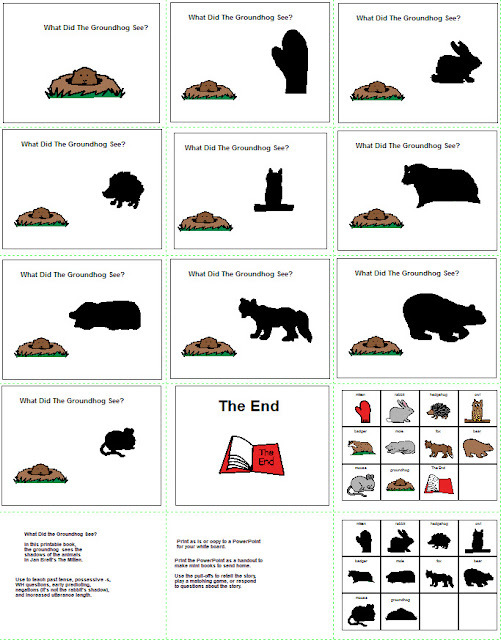 (spatial concepts), a Groundhog Mad Lib, a simple sequencing activity, stories, a poem, and Groundhog Day vocabulary pictures. Check out the 17 free downloads at Teachers pay Teachers targeted for speech and language therapy. Last year, Speech Lady Liz posted Groundhog Prepositions, an irregular past tense activity, Groundhog, Groundhog, What do you Wear?, and 6 More Weeks of Winter/Spring is Right Around the Corner Articulation Game. At Speech Therapy Tool Box, find WH questions and prediction questions to go along with the book Go to Sleep Groundhog! by Judy Cox. Follow-up by playing the WH question game, Help the Groundhog Find his Shadow, found at Speech Time Fun. There were several Groundhog Day suggestions at Speech in Motion, but I liked Make Your Own Groundhog Burrow. This was created to target turn-taking, Groundhog Day vocabulary, prepositions, following directions, and understanding facial expressions and emotions. Take photos or videos of the activity to share and use for retelling and vocabulary reinforcement. For SLPs with readers and writers, read Groundhog Day by Gail Gibbons to learn about Groundhog Day, its origins, and facts about groundhogs. At Finally in First a circle map and post-it notes were used to organize facts. The Groundhog Day Ask and Graph, found in the Groundhog Mini Unit at 2 Teaching Mommies, would be good practice for those learning to ask questions or for carry-over articulation or grammar skills. This could be used as home practice or during therapy. As a part of the therapy session, it would be fun to take a walk with students to visit "prepped" participants throughout the building to ask the questions. The poem and groundhog puppet found at Preschool Alphabet would make a good, but simple vocabulary lesson. Teach the vocabulary groundhog, around, bright, cloudy, and/or fright. This poem might also be a nice introduction to a phonological awareness lesson about rhyming.